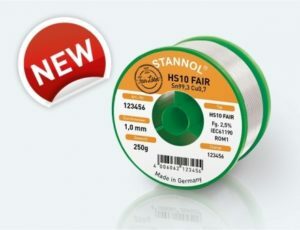 Stannol in collaboration with the FairLötet initiative presents the first fair solder wire. Tin in the form of tin solder is used in every electronic product, from the mobile telephone to the television. It is needed to connect the various components in the device with each other. Most of the tin is mined in developing and emerging economies. This mining often places a large burden on people and the environment. The idea for a fair tin solder that is produced without exploitation of people and environmental damage originated in the summer of 2014. The criteria for fair tin solder have been defined in close collaboration between Stannol and FairLötet and have been published in a white paper. Part of the proceeds from the sale of the solder wire are used to support organisations in the countries concerned and the further work of FairLötet.